USF is part of a five-year $32.6 million grant that will continue and expand the work of the national Technical Assistance Center on Positive Behavioral Interventions and Supports (PBIS), funded by the U.S. Department of Education's Office of Special Education Programs (OSEP) and the Office of Elementary and Secondary Education (OESE). While the Center has been funded consistently since 1997, it will now begin a fifth five-year cycle of federal funding with the largest amount ever allocated for its efforts. 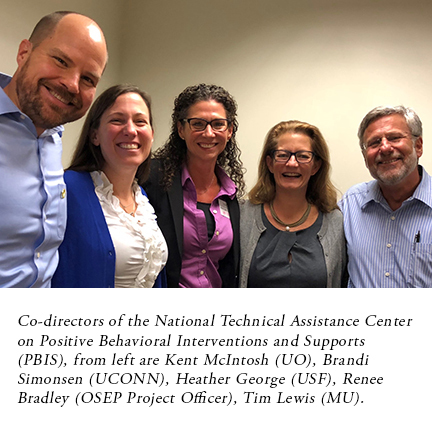 In fact, the PBIS Center is now the second longest funded center by OSEP and the fastest scale-up of any funded technical assistance center in its history. The University of Oregon’s College of Education is the lead institution in a network that includes the University of South Florida, University of Connecticut and the University of Missouri and a total of 11 partner organizations nationwide. USF is expected to receive about $4 million dollars over the next 5 years. Dr. Heather Peshak George is now Co-Principal Investigator and Co-Director of the national Center and Dr. Don Kincaid will serve as a Center partner. Both Drs. George and Kincaid have provided extensive expertise through their work in the Florida Center for Inclusive Communities, a University Center for Excellence in Developmental Disabilities, housed within Child & Family Studies at USF’s College of Behavioral & Community Sciences. Faculty from FCIC have been engaged in three decades of leadership research, training, and implementation of PBS within early childhood and K-12 settings. 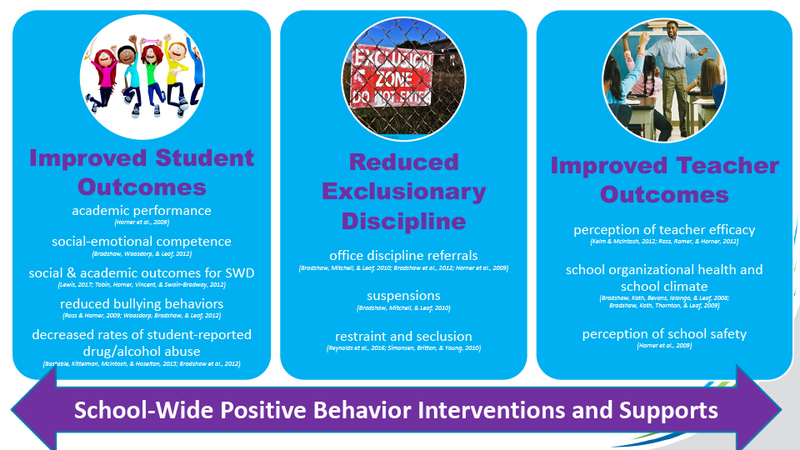 The PBIS Center works to improve social, emotional and academic outcomes for all students, including students with disabilities and students from underrepresented groups by providing systems of support that improve lifestyle results by making problem behavior less effective, efficient, and relevant, and desired behavior more functional. Different types of support matched to each student's needs is referred to as a multi-tiered system of support (MTSS). “While USF has always been a subcontractor with the national Center over the past two decades, this is the first time that USF is co-sharing the lead at the national level,” said Dr. George. The PBIS framework has been implemented as a whole-school approach in over 26,000 schools in the United States. Florida has the 2nd largest number of schools implementing PBIS in the country, with almost 2,000 schools trained (over 50% of the state’s schools) across 58 districts (about 80% of the state’s school districts). “Our work will build on our solid evidence base demonstrating the positive impact of school-wide PBIS on social, emotional, and academic outcomes for all students. Our goal is to extend the multi-tiered support to schools locally and statewide, with a particular focus on implementing and sustaining systems for targeted and intensive supports for students most in need. We need to critically examine the issues affecting our schools, students and families today for prevention and get individuals the help they need quickly” said Dr. George. The official PBIS Center kick-off meeting at OSEP occurred in Washington DC on October 29-30, 2018. Dr. George and her fellow PBIS Co-Directors delivered a formal presentation at the USDOE on the history of the PBIS Center across the last 20 years and the specific objectives outlined for the next 5 years. "These are very exciting times for USF, for Florida, and for all educational systems and their students across the United States. We look forward to expanding our knowledge into additional settings, continuing to enhance school climate and school safety by working to improve conditions for learning that promote the well-being of all students, and sustaining our implementation efforts." Additional priority efforts will be informed and supported by content expertise from Kathleen Lane (KU), Mark Weist (SC), John Seeley (UO), and Jeff Sprague (UO). George, Heather Peshak , Ph.D.